A Sea Wolf launches from its canister on a Type 22 frigate. Picture courtesy of Andy Cashmore. Sea Wolf on Launcher. IWM Photograph CT 395. Sea Wolf is a point defense missile normally carried in a six-round launcher although newer ships employ a VLS. The missile is a beam-rider with terminal guidance. Sea Wolf was originally envisioned as a supplement to Sea Cat, with the capability of engaging supersonic targets. It proved quite successful during the Falklands War, reportedly shooting down five aircraft. During one reported incident, four Argentine aircraft attacked a single frigate. Two were shot down and one crashed while trying to escape a Sea Wolf missile. Only the fourth aircraft escaped. 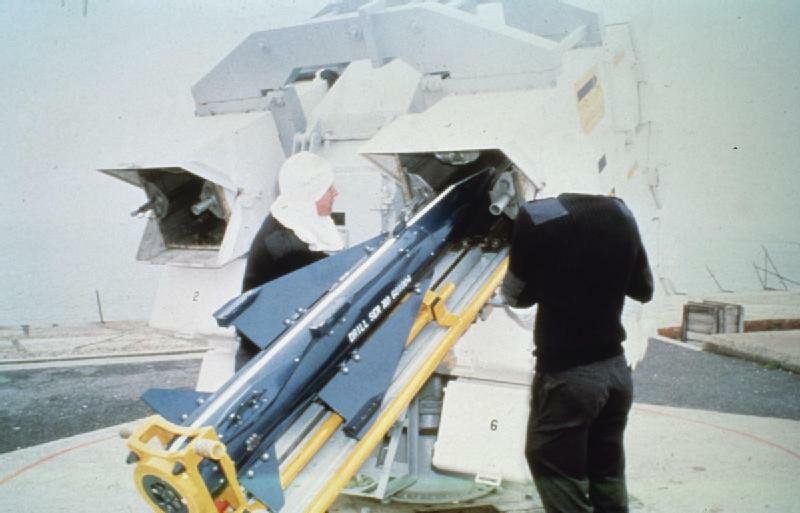 GWS-25 is carried in a six-round trainable launcher. GWS-26 is carried in VLS tubes. GWS-27 was a more sophisticated version cancelled in 1987. It would have used an active seeker and a phased-array tracker. It was to have had twice the range of the earlier missiles. Special help from Tony Gandy.